Please note that ARC's Facing Race 2012 Conference will take place as planned on Nov 15-17 in Baltimore, Maryland. ARC NY office and phones were impacted by Hurricane Sandy. So please either contact us by email or contact our Oakland office by phone at (510) 653-3415. Facing Race is a conference like no other – it is the largest national, multi-racial gathering of leaders, educators, journalists, artists, and activists on racial justice. Attendees share their knowledge on advocating for racial justice in all walks of life. And this year we are especially excited to be welcoming keynote speaker Junot Díaz! Keynote speaker Diaz received the Pulitzer Prize for his 2007 novel, The Brief Wondrous Life of Oscar Wao. In Díaz’s writing, the impact of structural racism is illustrated in a tangible, accessible and engaging way. His reflections on culture, art, and resistance will inform our discussions about racial justice. Facing Race conference sessions will address topics such as 2012 election, economy, arts & culture, LGBTIQ & sexuality, education reform, multiracial organizing, immigrant rights, and the development of racial justice leadership and training models. Workshops offer attendees a chance to develop hands-on strategies for positive social change. The post-election timing of ARC’s 2012 Facing Race National Conference is fitting as the Applied Research Center celebrates its 30th Anniversary, reviewing key racial justice successes over the past 30 years and setting a bold, ambitious course for the next 30. Elections come and go, but the work to advance racial justice and achieve equity will continue. Facing Race attendees will talk politics and examine the cultural landscape from a racial justice perspective, evolving strategies for policy change in the coming years. Previous Facing Race speakers have included: Melissa Harris-Perry, Van Jones, Walter Mosley, Eddie Palmieri, and Sherman Alexie. DJ Bobbit Garcia a.k.a. Kool Bob Love is the co-founder of Bounce Magazine and the critically acclaimed author of Where’d You Get Those? NYC’s Sneaker Culture: 1960-1987 (Testify Books). 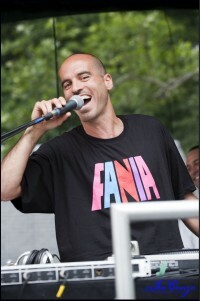 He also recently co-directed the documentary, Doin It In The Park: Pickup Basketball, NYC (www.doinitinthepark.com) and has been touring the world spinning records at various events.